We’d love your help. Let us know what’s wrong with this preview of Never Kneel to a Knight by Regina Scott. When the thoroughly poised Charlotte Worthington requests that Miss Thorn and her cat Fortune find her a position, she never dreams the savvy employment agency owner would reunite her with Matthew Bateman, her brother’s former bodyguard. Matthew is about to be knighted for an act of valor, and he and his sisters could use some polishing if they’re to enter Society after hi When the thoroughly poised Charlotte Worthington requests that Miss Thorn and her cat Fortune find her a position, she never dreams the savvy employment agency owner would reunite her with Matthew Bateman, her brother’s former bodyguard. Matthew is about to be knighted for an act of valor, and he and his sisters could use some polishing if they’re to enter Society after his elevation. Yet how can Charlotte maintain her calm, cool demeanor as their sponsor when she harbors a secret love for him? He rose and inclined his head. “No, that’s reserved for us common folk,” he said. “Like what?” he asked, struggling to see her as anything less than perfect. “Like boxing,” she said with certainty. To ask other readers questions about Never Kneel to a Knight, please sign up. I love stories with a "Beauty and the Beast" theme going on! The previous book in the series hinted at Charlotte and Matthew's regard for each other, so I was eagerly anticipating their story, and it did not disappoint. At the beginning of the story they are trying to avoid each other because they know their feelings could not lead to anything. Charlotte is so lovely with his sisters as a mentor and friend, and it was fun to see the different personalities of the girls. Matthew and Charlotte nat I love stories with a "Beauty and the Beast" theme going on! The previous book in the series hinted at Charlotte and Matthew's regard for each other, so I was eagerly anticipating their story, and it did not disappoint. At the beginning of the story they are trying to avoid each other because they know their feelings could not lead to anything. Charlotte is so lovely with his sisters as a mentor and friend, and it was fun to see the different personalities of the girls. Matthew and Charlotte naturally warm up to each other despite their misgivings, and become a team as they work together to face a variety of obstacles and struggles. They have great chemistry and there are a few different plot threads that made the story dynamic and well-paced. Loved this escape into Regency England once again! Regina Scott brings us the fifth book in her 'Fortune's Brides' series, Fortune, being the very discerning cat of Miss Meredith Thorn, who runs an employment agency. Miss Charlotte Worthington seeks Miss Thorn's aid in finding a position suitable to her rank as the daughter of a viscount. She is placed in the household of Mr. Matthew Bateman, former bodyguard to Charlotte's brother, also known as the Beast because of his pugilistic prowess. Mr. Matthew Bateman is soon to become elevated to a kni Regina Scott brings us the fifth book in her 'Fortune's Brides' series, Fortune, being the very discerning cat of Miss Meredith Thorn, who runs an employment agency. Miss Charlotte Worthington seeks Miss Thorn's aid in finding a position suitable to her rank as the daughter of a viscount. She is placed in the household of Mr. Matthew Bateman, former bodyguard to Charlotte's brother, also known as the Beast because of his pugilistic prowess. Mr. Matthew Bateman is soon to become elevated to a knight by the Prince Regent for saving his life from being crushed in Charlotte's brother's flying balloon. Charlotte intends to make sure Matthew's sisters, all three of them, are coached in every way possible so that they can enter society and make good matches. However, she herself has long had feelings for Matthew. As for Matthew, he, too, harbors feelings for Miss Worthington, but what has he to offer her? A sweet a Regency as you'd want to read, Regina Scott delivers the goods in fine form this go round, as in the previous four books in this series. I love a good Regency and Scott knows how to do one well indeed. Highly recommended. *My thanks to the author for a preview copy of this book. The opinion stated here is expressly my own. 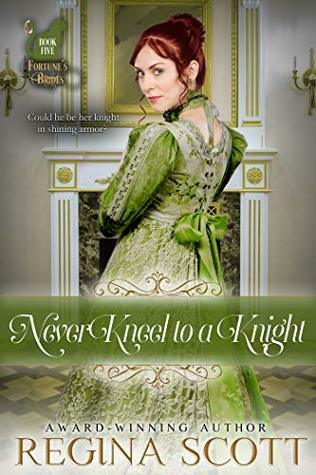 Charlotte was wonderful Never Kneel to a Knight was a delightful story! I enjoyed seeing Charlotte help Matthew and his sisters learn to navigate society. This story could possibly be enjoyed as a stand alone, however, reading the book directly before this novel, Never Vie for a Viscount, would be helpful as Charlotte and Matthew do appear quite frequently in it. This series also has romance that slowly builds throughout each book and centers around Miss Thorn, the owner of the employment agency. Somehow, in all the movies I've seen and the books I've read, I've always assumed that to be knighted was not only a great honor, it was also a big deal in general. I've never before considered the implications of going from a more "common" background to being elevated into a society that snubs those deemed "unworthy". . . These are exactly the circumstances Matthew, aka the Beast of Birmingham, finds himself in. You may remember him from Never Vie for a Viscount, which released last December. Matthew descends from a tradesman who didn't even have the distinction of owning a factory or a mill - he simply worked there. So when he is on the verge of being knighted for saving the Prince Regent's life, he needs help. His sisters do as well. There are so many things they need to learn to be accepted into their new world. I really liked the way the author brought out the challenges this life change would have caused this family and had me considering what it really would be like. Matthew may have a ""common"" background, but he has the heart of a prince. The thoughtfulness he shows his sisters is as sweet as is the way they trust him implicitly. And of course, the youngest, Petunia, has him wrapped around her little finger. While there is not as much intrigue or mystery in this as in previous books of the series, it is still a pleasurable read for those who enjoy historical, Regency romances. The confrontation with the Sorrels is narrated in great detail. The author's description of the events of that terrible night contained in such great detail I felt like I was watching a movie. And yet despite the bullets, knives, and other weapons, it was not overly violent or bloody. When the thoroughly poised Charlotte Worthington requests that Miss Thorn and her cat Fortune find her a position, she never dreams the savvy employment agency owner would reunity her with Mathew Bateman, her brother's former bodyguard. Matthew is about to be knighted for an act of valor. Yet how can Charlotte maintain her calm, cool demeanor as their sponsor when she harbors a secret love for him? Matthew Bateman cannot forget the beauty who is miles out of his league. Once a boxer called the Beast of Birmingham, Matthew would like nothing better than to be worthy of Charlotte's hand. As old enemies and new ones attempt to bring him low, can Matthew prove to Charlotte that their love is meant to be? This sweet, clean Regency romance is the sequel to Never Vie for a Viscount Fortune's Brides: Only a matchmaking cat can hunt true love. Regina has done such a great job with this book, this series. Once you start reading you find yourself reading faster and not wanting to put the book down. I can highly recommend this book/series as I normally don't read a lot of Regency books but these have been great. Charlotte Worthington has sought employment to fill the emptiness in her life. However, she was certainly not expecting Miss Thorn to place her in the household of Matthew Bateman, the man who had been a bodyguard for her brother! She sets herself to the task of making Matthew and his sisters ready for entry into society. Can she trust her heart to the newly made knight? Every book in this series leads to the next one. At the end of the previous book, we were left with the knowledge that Charlott Charlotte Worthington has sought employment to fill the emptiness in her life. However, she was certainly not expecting Miss Thorn to place her in the household of Matthew Bateman, the man who had been a bodyguard for her brother! She sets herself to the task of making Matthew and his sisters ready for entry into society. Can she trust her heart to the newly made knight? Every book in this series leads to the next one. At the end of the previous book, we were left with the knowledge that Charlotte admired Matthew but wasn't willing to act on it. The more she associates with the Bateman siblings, the more she is willing to support and defend them from the sticklers in society. Miss Thorn maneuvers the matter so that Charlotte is forced to associate with the new knight. And Meredith's own budding relationship with Jullian progresses. Fortune looks on, making her own feelings known whenever necessary. Charlotte Worthington is at loose ends. Now that her brother is married, it's Lydia's place to run the household. Fortunately, Miss Thorn has found a job for her. A soon to be knighted fellow and his family will need guidance into entering Society. Perfect. Hopefully it will keep her mind off the man she can never have. Matthew Bateman aka the Beast of Birmingham just happened to save the Prince Regent's life and has gained himself a title. He and his three sisters were just fine without a title. Now they have to follow Society's rules. And of all the women to come to help his family...it would be her...Charlotte. The difference in the “classes” is so clear in this story. How it matters to some, but not all. Also, escaping the past is harder than it seems. Especially when people like to use your past against you. Another excellent story in this series. This series just keeps getting better & I don’t want it to end. HEA at it’s best. Loved it ❤ This series just keeps getting better & I don’t want it to end. I liked this story very much. The characters have been attracted to each other for a long time and finally get a chance to admit their attraction. Regina Scott started writing novels in the third grade. Thankfully for literature as we know it, she didn't actually sell her first novel until she had learned a bit more about writing such as vocabulary, sentence structure, and plot. After numerous short stories and articles in magazines and trade journals, she got serious about her novel writing. The Unflappable Miss Fairchild was her first nove Regina Scott started writing novels in the third grade. Thankfully for literature as we know it, she didn't actually sell her first novel until she had learned a bit more about writing such as vocabulary, sentence structure, and plot. After numerous short stories and articles in magazines and trade journals, she got serious about her novel writing. The Unflappable Miss Fairchild was her first novel to be published (March 1998).